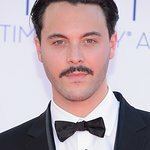 Jack Huston is best known for his role as Richard Harrow on Boardwalk Empire. His aunty is Anjelica Huston. Google trends for "Jack Huston"
We don't have any videos related to Jack Huston.